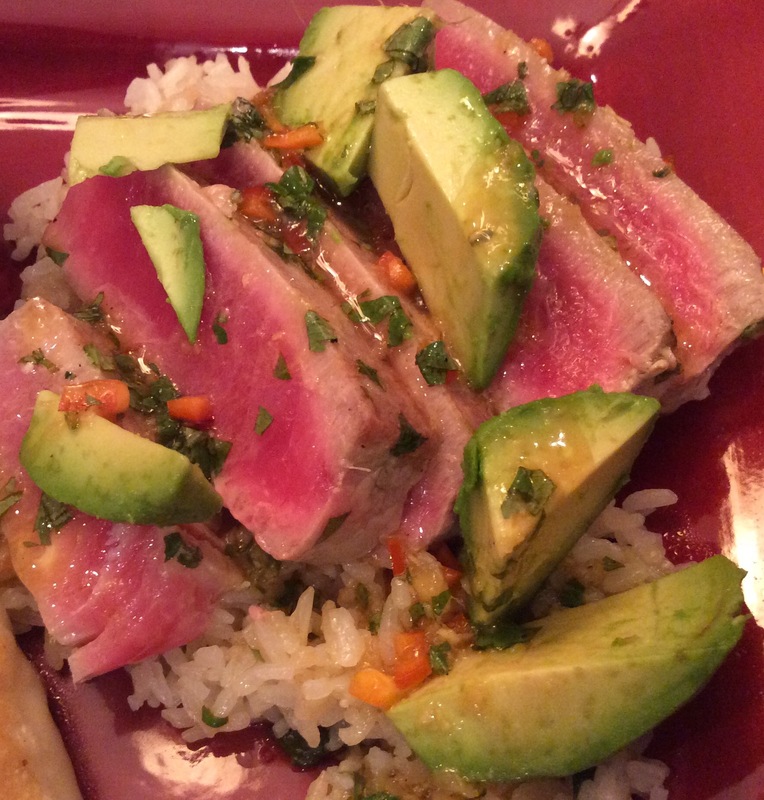 Pan-Seared Tuna with Avocado, Soy, Ginger, and Lime….Dinner Done “Light”! Yesterday, I awoke to the most beautiful fall day in East Tennessee and decided that dinner tonight needed to be just as picturesque and natural. So, with that in mind, I called my favorite place in Knoxville to get the freshest fish in town (The Shrimp Dock), to inquire if they had “sashimi grade” tuna. A friendly voice told me yes and I headed off to pick it up. Upon arriving, I saw the most beautiful tuna I had seen in a long time and was greeted by the same friendly voice I had heard on the phone. He instantly knew it had been me by my accent and we had quite a laugh over the beauty of the southern dialect . Although I love going to the Shrimp Dock, he made my visit extra special! Thank you! I couldn’t wait to get home to get started on a new recipe I had seen by Tyler Florence. I love tuna but often it comes out dry when you attempt it at home but this recipe seemed clean and simple. It is imperative that a good piece of tuna not be overcooked, but served rare and just seared enough to give a light char on the outside. Another appealing ingredient that leaped out at me was the use of fresh avocados…combine that with soy, ginger, and lime, you have fresh flavors at its best! I served it with an Asian Cucumber Salad (I will share that easy recipe in a future blog) and some Jasmine Rice and Shrimp Dumplings. 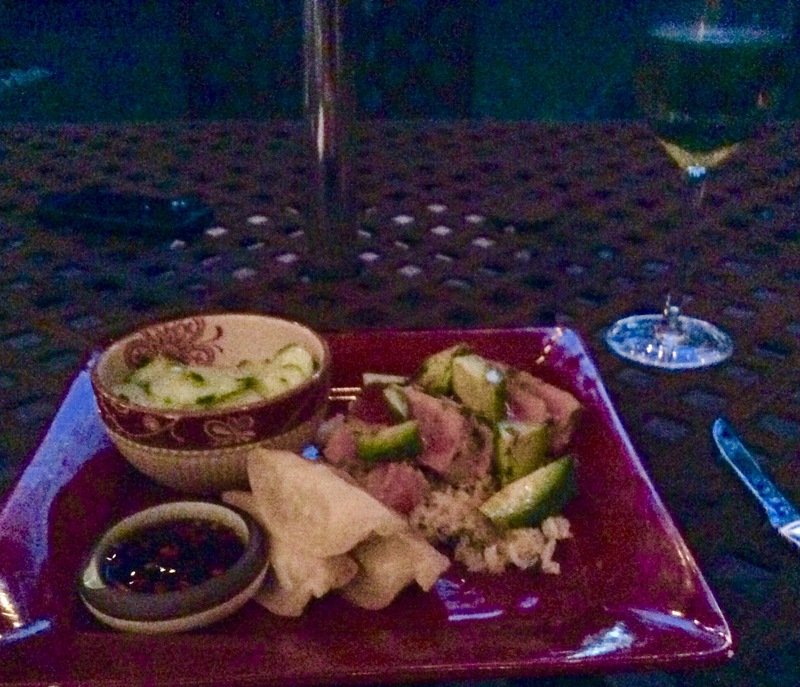 It was a perfect dinner to eat outside under the stars with a glass of wine! 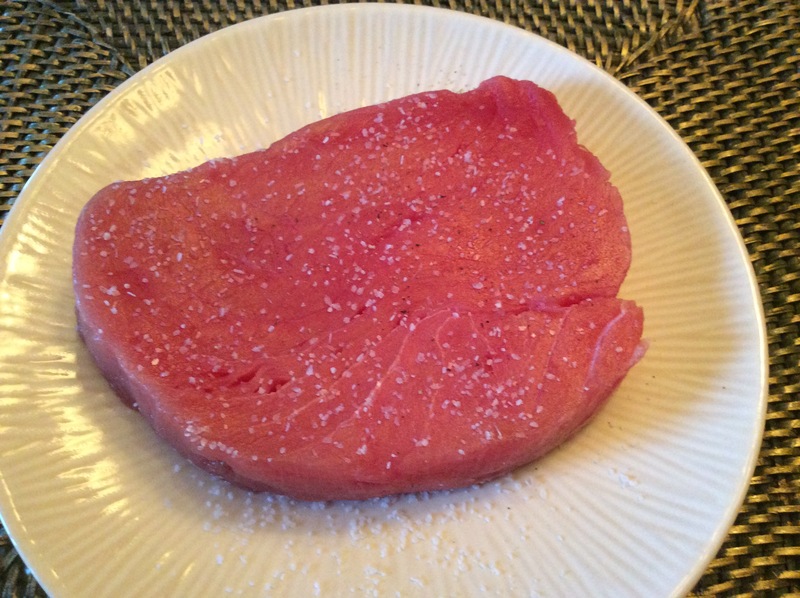 Place a skillet over medium-high heat and coat with the remaining 2 tablespoons of olive oil. Season the tuna generously with salt and pepper. 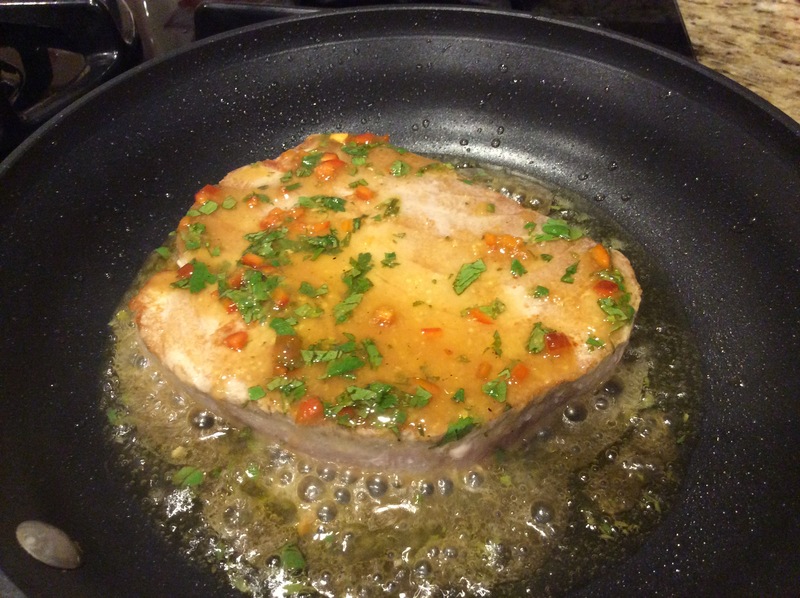 Lay the tuna in the hot oil and sear for 1 minute on each side to form a slight crust. 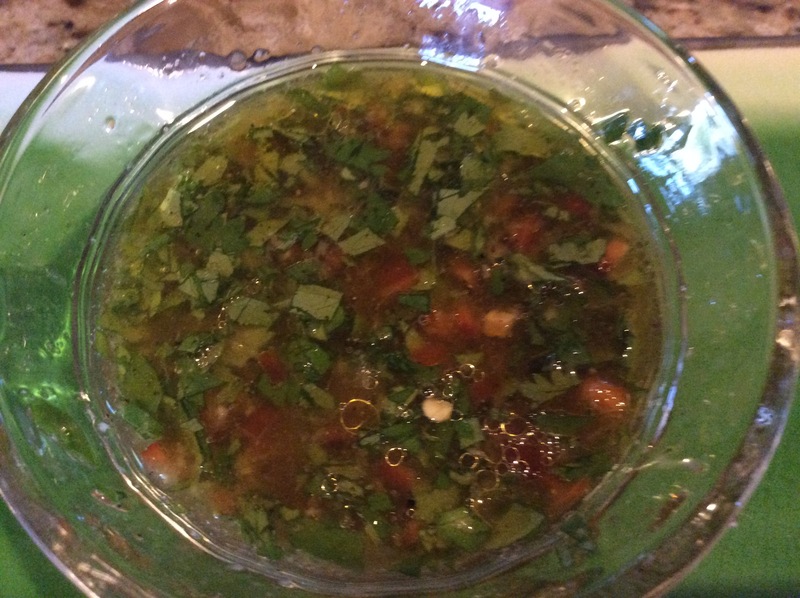 Pour 1/2 of the cilantro mixture into the pan to coat the fish. 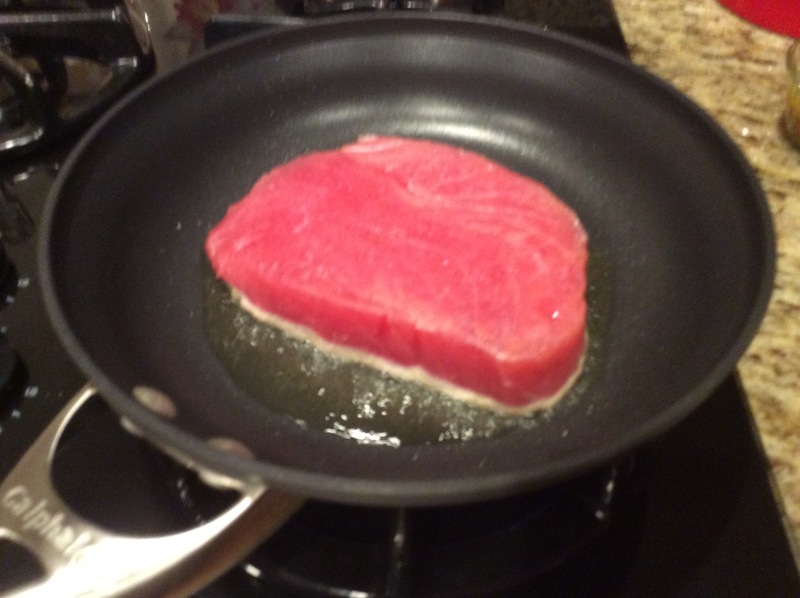 Both sides are seared lightly then add that lovely sauce! 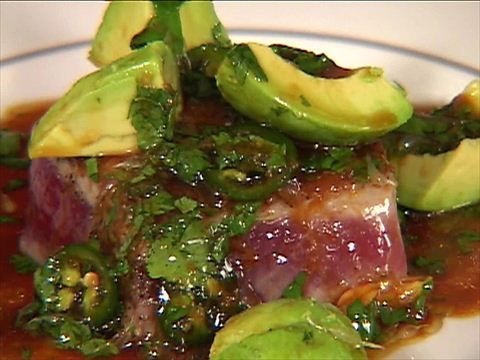 Serve the seared tuna with the sliced avocado and the remaining cilantro sauce drizzled over the whole plate. A perfectly seared tuna over rice with a tasty sauce…so yummy! Add the wine, the stars, and some good company…this dish is a winner! Bottom Line: This is truly a recipe that you can’t mess up…it’s that simple! The presentation is so beautiful that I would be proud to serve this at any dinner gathering with friends but its also easy enough that I could make it for just myself when hubby is away. The flavors meld perfectly together and I highly recommend you try this in your kitchen! I am Chef Frankie…Always in the kitchen, having fun, and cooking with wild abandonment! Yum!!! I am DEFINITELY making this soon. 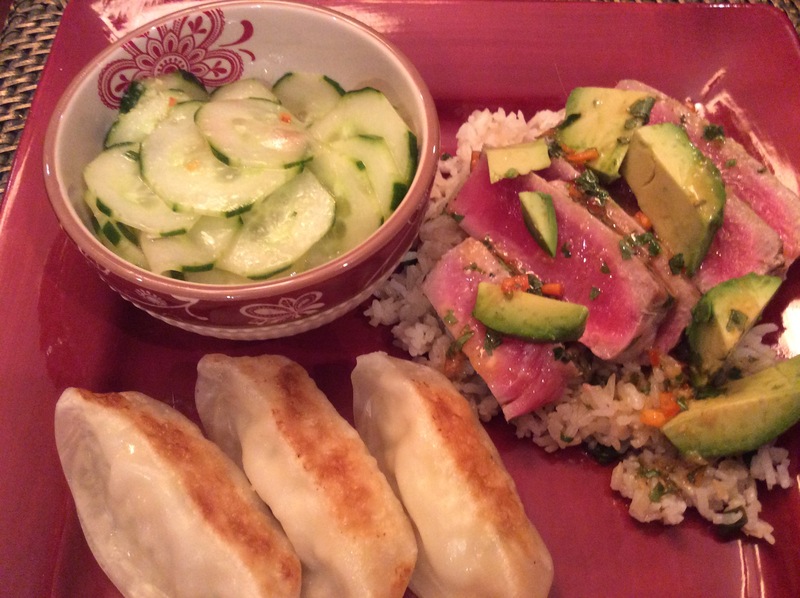 Tuna has always been an intimidating ingredient, so thank you for sharing the easy recipe! !